In the wild, young rhesus macaques can reasonably expect not to have their mothers replaced by kitchen props. The monkeys depend on their moms to nurse them and tote them through tree branches while they're small, just like other primates. But a laboratory experiment in Maryland took these babies from their mothers and had them raised alone or in groups of their peers. The monkeys' strange infancies had physical and mental effects that lasted into adulthood. At the National Institute of Child Health and Human Development (part of the National Institutes of Health), rhesus macaques born between 2002 and 2007 were randomly assigned to one of three groups. The lucky first group got to stay with their mothers, who kept their young close by while living in a large cage with other monkeys. The rest of the young monkeys were taken from their mothers and reared by humans in a nursery for their first five weeks of life. Then, if they were in the second experimental group, they were put into a cage with three other monkeys of the same age. The four peers were left to "raise" each other, Lord of the Flies style. The final group of monkeys, after being nursed by humans for five weeks, spent two hours a day in these same peer cages. During the remaining 22 hours, they lived alone in a cage with a "surrogate mother." The name is a bit of an insult to primate intelligence, though, since researchers describe this object as "effectively a terry cloth-covered hot water bottle hanging from the top of the cage." By the end of their first year of life, all the juvenile monkeys had been moved from their experimental cages into one social group. 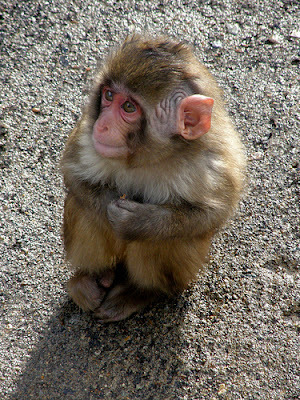 Now the researchers, led by Gabriella Conti at the University of Chicago, began to collect data on the monkeys' health. Over the years of the study, they watched 231 rhesus macaques grow up in this bizarre daycare system. Even though the monkeys all ended up living together, their disparate childhoods left a mark. The first clear effect was illness. Male monkeys that had been raised by a "surrogate" got sick nearly twice as often as mother-raised or peer-raised monkeys, even though by this time in their lives they all shared the same living conditions. Nearly every surrogate-raised male monkey had an illness at some point during the study. Female monkeys that had been raised by peers, rather than by a real or fake mother, were more likely to have wounds and bald patches once they were living in the large group. Since these females displayed more aggressive behavior, the researchers think they may have been starting fights with the other monkeys. Their aggression may have goaded other monkeys into biting them and pulling their hair out. And across all the groups taken away from their mothers—male and female, peer-raised and surrogate-raised—monkeys were more likely to have repetitive habits called stereotypies. In the zoo, a stereotypy such as pacing or swimming in circles suggests that an animal is in distress. In humans, stereotypies can be a symptom of autism. Habits displayed by the rhesus monkeys in this study included "digit sucking (the most frequent behavior), pacing, head tossing, self-grasping, saluting, spinning, rocking, circling, and swinging." Some of the difference between monkeys raised by their mothers and the rest could be due to breastfeeding, Conti points out. But the increased illness in male monkeys was limited to the surrogate-mom group; the peer-raised monkeys, despite also missing out on breastfeeding, didn't have extra illnesses. And although all motherless monkey groups showed an increase in stereotypy, the effect was greatest in surrogate-raised males. This suggests that even if formula feeding causes some of the health effects seen here, it can't account for all of them. The not-shocking conclusion is that monkeys need their moms to develop normally. Being raised parentless seems to make them less able to cope with infections or social stressors later in life. It's something to consider for research centers or zoos raising animals without their mothers. Even if the young have been orphaned or abandoned, there may be ways for human keepers to mitigate the damage. Conti is an economist, though, and she's more interested in another primate: humans. She compares the rhesus research to studies of human children raised without either of their parents. These studies have found mental and physical health effects in children in Romanian orphanages, for example, or Israeli kibbutzim (where kids were raised communally). As smart and independent as we are, we're still primates who need someone to haul us through the tree branches when we're young.